I can't tell you how excited I was when Alana contacted me about this product. My Little Picasso will take your child's artwork, from the past year, month, (or even week!) and get rid of the household clutter by creating a beautifully bound book for your coffee table or bookshelf. The books are made from the best quality paper and materials to highlight the work of your little artist. You can even decide what goes on the cover! 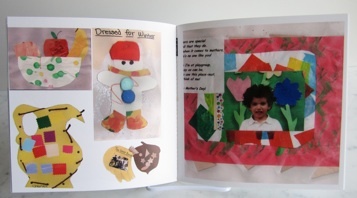 All books are custom made to each child, and in addition to artwork, we can include photos, report cards, letters from camp, etc. - anything you want to save forever but don't have the space for! We will also take care of everything, we can send you a box to send us the artwork, or pick it up personally. Then, it will be returned to you with the newest addition to your bookshelf. It makes great birthday gifts for Parents and Grandparents. The opportunities to create something beautiful are endless, whether it is just to make your home a little neater, or give a unique and customized gift to someone you love. And I get to give a 20 page softcover book away to one of you. That's a $75 dollar value, huge! What a cool product! Thanks for the giveaway! SO fun! I would love to win! These are so cute. I would love to make one for my daughter. this is such an awesome idea!! i would luv to do it. I have a ton of boxes of keepsakes with just one, lol! I so need this! I am swimming in artwork! Great idea - I love that they can send you a box to put all the artwork in. Thanks!! I would LOVE to get that book! My daughter and I fight all the time about how much artwork we can keep, and this would solve that problem! This book is a terrific way to keep the clutter to a minimum!!! I have a 4 year old daughter and already have 5 large boxes full of keepsakes! Ugh!!!! That's such a neat idea! Awesome. I'd love to win this one! What a great giveaway- We would love to win- Thanks for hosting. I have 4 children. This would be a perfect way to start organizing their art work. This is an awesome giveaway.... Thanks for offering it up.